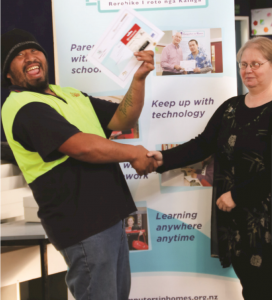 January 2019: Computers in Homes Connect restarts, supported by the ‘Digital Literacy – Computers in Homes’ Fund operated by the Tertiary Education Commission. May 2018: The 2018 Budget did not include funding for Computers in Homes. October 2017: The new Labour/NZ First Coalition Government announce they would restore funding for Computers in Homes. 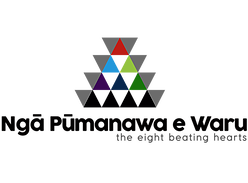 August 2017: 20/20 Trust releases its widely-supported Manifesto for Digital Inclusion. May 2017: With government funding for Computers in Homes ending on 30 June 2017, 20/20 Trust publishes New Zealand’s Digital Inclusion Challenge: Beyond Computers in Homes. This describes the future for digital inclusion in New Zealand and a new approach to digital inclusion. The new approach retains the core elements of Computers in Homes that have worked well in the past – local community engagement and building digital confidence – and offers greater flexibility in how the needs of specific communities are met. Computers in Homes provides digital skills training, technical support, refurbished computers and home internet to students’ families in low-decile schools – equipping them for the digital world. Computers In Homes is an educational intervention digital literacy programme to bring computer technology and the internet within reach of all New Zealand Families with school aged children. It helps demystify technology, gives children, parents and grandparents opportunities for intergenerational learning, improves parent/school relationships and promotes digital literacy in the community. The 20/20 Trust provides a recycled computer, subsidised Internet access, 20 hours of training, and technical support to families who would not otherwise have the opportunity to be part of the online world. Parents complete computer training at their children’s schools and make a small financial contribution before the PC goes home. They learn basic care of their machine, plus the support procedures set in place via the school. about how the programme works, and what it has meant for them. 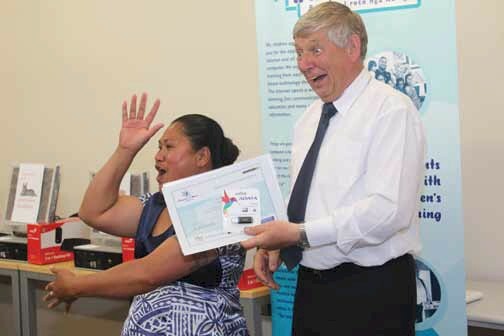 Wairarapa Computers in Homes training graduate Fale Lio delighted at her graduation ceremony, with an equally delighted Masterton District Mayor, Gary Daniel. Computers In Homes began as a pilot project in 2000, in the lowest-income community in the country, its purpose being to raise the literacy level of children from low decile schools. As the scheme has developed and spread, parents have embraced the learning experience for themselves, so the focus has broadened to family literacy. In some regions, the steering committees have expanded their vision further to encompass community literacy. Schools report increased school/home communication and more positive interaction between parents and teachers. Some parents have completed university degrees and other qualifications in teaching, social work, computing and the arts.What began as a project to bridge the digital divide has become a notable contribution to social capital in under-served communities. Computers in Homes participant Melissa with her girls and her refurbished computer. We are pleased the government funded support for another 1,630 families in 2016-17, and we reached another 175 by again overachieving our goal. In total, the 20/20 Trust’s Computers in Homes programme has helped nearly 19,000 families – but there are still many thousands more needing the digital skills and access that Computers in Homes imparts. 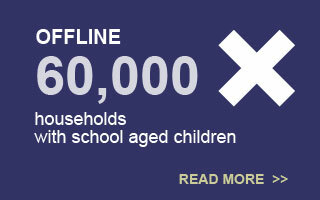 The 2013 Census showed that 62,000 households with around 200,000 school-aged children do not have internet access and we estimate at least 40,000 households with children are not connected. Delivering in areas of greatest need. In its last year, we supported families in 19 targeted regions and 4 sub-regions in Auckland. 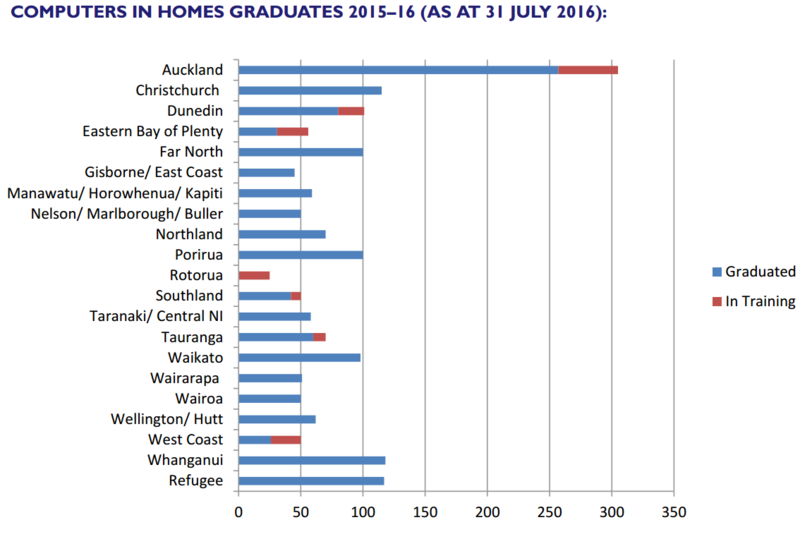 All these areas were identified in the 2013 Census as digitally under-served communities, with south Auckland standing out as needing most help. 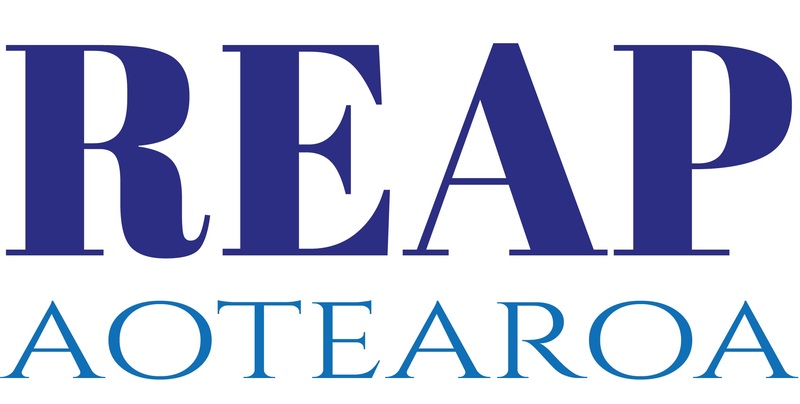 Over the last year we have greatly increased our efforts in south Auckland and now have four coordinators there, with more trainers and support staff. The demand for the programme greatly exceeds the funding available – we continue to give priority to families in decile 1 to 3 school areas in the most digitally disconnected communities. We recognise that there are many families in higher decile schools who are just as digitally disadvantaged and we include them in local programmes where available. An external review by Martin Jenkins in 2015 concluded that Computers in Homes offered ‘value for money’, recommended funding be increased, and also acknowledged that the benefits were much broader than education. 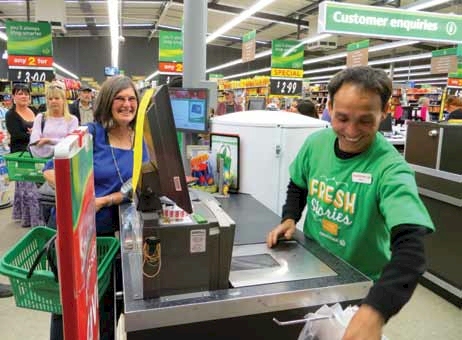 James Hlawnceu serves his former Computers in Homes trainer, Dianne Goodwin, in a Nelson Countdown supermarket. James, his wife Elizabeth and two teenage boys arrived in New Zealand as refugees from the Chin state in Burma. In 2006 they were part of Nelson’s first intake in the Refugee Computers in Homes programme, based at Victory School. James and Elizabeth have assisted as bilingual support and family liaison for subsequent intakes of Burmese refugees and for community interpreting. James began as a shelf-stacker and soon became the store’s favourite checkout operator. Several other graduates from the CIH Refugee programme also work in Countdown supermarkets in Nelson. Government new settler programmes have also incorporated CiH into their education strategy for newly arrived refugees, with the additional support of interpreters, family liaison workers, transportation and babysitting to remove barriers to participation. It is envisaged that the access to information for new settlers and the engagement with their children’s schools will assist families to readjust to a new country and become part of the wider community. The Ministry of Education continues its support for the refugee Computers in Homes programme, and for 2016-17 are funding for 130 families. In 2015-16 117 graduated, in 5 regions. This programme is now in its 13th year, and has helped 1,134 refugee families. We published two substantial reports on programme results during the year: one in January and another in July. Approximately half of all participants are Maori and we have seen an increase in the percentage of Pasifika families, rising from 8% in 2010 to 18% in 2015 and 2016. We survey families a year after they graduate and we are continuing to find significant numbers enrolling in higher education and many improving their job situations, either finding a job or gaining a promotion. During 2015-16, 34% of surveyed graduates enrolled in further training and 22% gained a new job or a promotion. 37% also said that another member of the household gained a new job or a promotion. technology solution back haul provided over fibre connections at nearby schools. Graduate Cindy Gutierrez Montano, a Colombian refugee mother, was determined to have her photo taken with the Computers in Homes banner. Beside her is the computer equipment she took home. 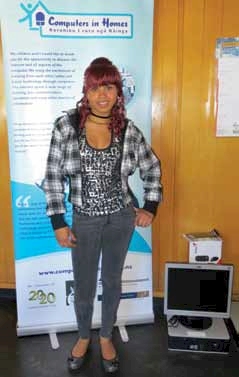 It is now 17 years since the first Computers in Homes programme in Cannons Creek, Porirua. The core elements of that programme – training, tech support, equipment, internet access and, importantly, celebrating success with graduations – continue to deliver fantastic results. We welcome the continuing support from central and local government politicians who attended these inspiring graduation events. 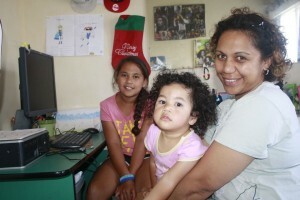 Computers in Homes had 23 coordinators delivering the programme to whanau throughout the country, plus support technicians and a devoted support team in Wellington. You’ll find full details on the Computers in Homes website. All 20/20 programme websites are linked from the very top of every page.